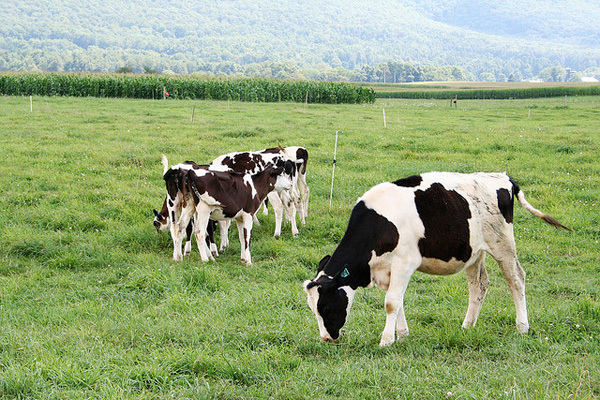 Cows graze on a summer's day in a Centre County farm. I remember back in the 90s, it seemed that exotic ingredients were all the rage. Menus bragged about things being “shipped all the way from ________”. Exotic ingredients were marketed in grocery stores. But this has definitely shifted. While exotic ingredients from far-off lands can still be found on restaurant menus and in, for example, our several excellent Asian food stores, I see more and more locations bragging about local ingredients served in their dishes. In summer 2016, the farm-to-table restaurant RE Farm Café will open out on Rt 45 in partnership with J.L. Farms, and The Field Burger and Tap, now open in Toftrees, is State College’s entry in the locally-sourced gourmet burger world. Farmers markets are more popular than ever, and we have a wide variety to select from in this area. Huntington, State College, Altoona, Johnstown and Clearfield all offer seasonal farmers markets, including several that move indoors for the winter. So, you can get your farmers market fix even on the coldest of winter days. Perhaps most telling is the invasion of local foods in the supermarkets. Byler Goat Farm products and now Big Al’s Mustards can be had at Wegmans. I’ve also noticed that supermarkets will advertise via signage what local farms grew the produce being sold. It certainly didn’t used to be this way. The Pittsburgh restaurant group Big Burrito (you’ve likely been to the State College location of their popular Mexican joint Mad Mex) locally sourced ingredients in the mid-90s for their then upstart restaurants Kaya and Casbah, and other restaurant owners thought they were crazy. Local sources are too unreliable, they were told. Now, many restaurants locally source ingredients. - Direct-to-consumer sales are the backbone of revenue for small farms, and as per the USDA, direct-to-consumer marketing has exploded from $551 million in 1997 to $1.2 billion in 2007. That’s a lot of farmers markets, CSAs, road-side stands, etc. - Farmers markets nationwide have grown from 1755 in 1994, when many were struggling, to 4,685 in 2008, to a whopping 8,144 in 2013. - In 2012, there were estimated to be more than 6,000 CSAs in the US. There were two in 1986. - In 2012, beginning farmers, meaning those who have farmed 10 years or less, operated 1/4 of the 2.1 million U.S. farms. So, it’s pretty clear… as Michele said, local food isn’t trendy. It’s here to stay.